Herbert Ashby was born in Wrenthorpe, Wakefield but had moved to Ossett and at the time of his enlistment in the British Army, he was living at 19, Audrey Street with his aunt and uncle, Mr. and Mrs. Bickerdike. In 1901 Herbert was 6 years old and living in Wrenthorpe, in the parish of Alverthorpe with parents, George and Mary Ashby plus five children. Four of them were named Ashby and the eldest named Florrie Pitchforth. Herbert's father George was a hewer in a coal mine and had married Mary Pitchforth in the December quarter of 1890 at Wakefield. By 1911, Herbert Ashby is aged 17 and a boarder with the Bickerdike family at Station Rd, Ossett. He was, like his father, a hewer in a coal mine. Private Ashby most probably went to war in France with the Army in January 1917, since he did not receive the Star Medal, which was only given to those who served overseas before 31st March 1915. "On September 2, 1st and 4th Canadian, accompanied by 4th British Division, attacked. Despite heavy close-quarters fighting, the divisions reached their objectives about two miles beyond the Drocourt-Queant Line. On the left, the supporting British 4th Division advanced south of the River Sensée. Tanks proved invaluable in crushing paths through the dense barbed-wire and dealing with strongpoints; despite heavy enemy machine-gun fire, the first objectives (the front-system of the D-Q trenches) were gained before 9am, and the follow-up battalions passed through the leading attacking waves. Despite the obvious strength of their field-defences, enemy resistance varied considerably and large numbers of German prisoners were taken. This modest victory, however, forced the Germans to undertake large-scale withdrawals all along the Western Front in anticipation of a breakthrough. Dawn found the trenches forward of the Canal du Nord abandoned. Allied high command was elated and realized that one more massive push might end the war before the year was out. The Canadians were immediately ordered to renew the advance, easily securing the ground to the front of the Canal du Nord by the end of September 3. The Kaiser wrote: 'Now we have lost the war!' "
Sadly, Private Ashby's army service record did not survive the blitz of WW2 on London. 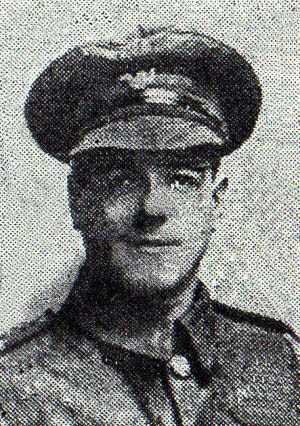 "Mr & Mrs Bickerdike, of Audrey Street, have received official notice that their nephew, Private Herbert Ashby, KOYLI, was killed in action on September 2nd. A few weeks ago another nephew wrote, stating that whilst looking for Herbert, his cousin, he was surprised to come across his grave". In a land of strangers, our dear nephew lies. None of us was near him, to bid him a last goodbye. We pictured his safe returning, we longed to clasp his hand. But God has postponed the meeting, it will be in a better land. There is in France, a grave unknown, where our dear nephew sleeps alone. three little words, "Forget Him Not". The KOYLI, 2/4th Battalion was formed at Wakefield on the 30th September 1914 as a second line unit. On the 1st of March 1915 they moved to Bulwell, Nottingham and were attached to the 187th Brigade of the 62nd (2nd West Riding) Division. They moved again in April 1915 to Strensall at York and on then in May to Beverley, going on in November to Gateshead, January 1916 to Larkhill and June 1916 to Flixton Park near Bungay in Sussex. They moved again in October 1916 to Wellingborough and landed at Le Havre on the 15th January 1917. Herberty Ashby is remembered on Panel 8 of the Vis-en-Artois Memorial in the Pas de Calais area of France3. This Memorial bears the names of over 9,000 men who fell in the period from 8 August 1918 to the date of the Armistice in Picardy and Artois, between the Somme and Loos, and who have no known grave. There are four cemeteries at Vis-en-Artois and the Memorial commemorates 9,841 men who died in WW1, including Herbert Ashby. At the Vis-en-Artois Memorial, there were 431 losses of Army personnel on the 2nd September 1918 and 23 of them came from KOYLI.